Neuro-linguistic programming (NLP) is a methodology to understand and change human behavior-patterns. The most well known figure in its development in the 1980s is Dr. Richard Bandler, an American author and trainer in the field of self-help. NLP teaches us to use the language of the mind to consistently achieve our specific and desired outcomes. NLP is often described as an instruction manual for the mind. A useful analogy would be to see the mind as a computer with a software “bug” that causes a specific and repeated unwanted response to user input. NLP in this analogy would be a software update, or “bug fix”, while the NLP Practitioner or Coach would be an IT Technician installing the new software so that the computer functions as desired by the user (the client’s stated goal(s)). 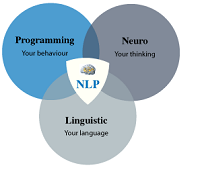 As with every aspect of NLP, the term ‘Neuro-Linguistic Programming’ is specifically descriptive; ‘Neuro’ refers to the mind and its sensory inputs, ‘Linguistic’ refers to language and non-verbal communication systems, and ‘Programming’ to programs (or thought patterns) we run to achieve our specific and desired goals or outcomes. I am now in a position to write a review to this listing after completing a NLP Practitioner course accredited by the American Board of Neuro-Linguistic Programming (ABNLP). My study has lasted months and involved listening to 40 hours of audio lessons (multiple times over), reading through the large accompanying 'manual', and taking a written test. I also read around the subjects of NLP, Time Line Therapy and hypnotherapy (they are all linked), both online and in seminal publications. All of this completed, I then attended an intensive 5 day one-to-one training course with an ABNLP-accredited NLP Master Trainer. The training I have embarked upon cannot be described as "cheap" butI feel it is well worth the investment, for the reasons below (and many more I am surely yet to discover and become aware of)! There was a lot of information to take in and NLP uses specific language that takes time to get used to. This however is intentional with the reasons becoming crystal clear after I experienced the techniques NLP teaches in person, with me acting as both client and practitioner throughout the practical training. I have to say however that it only took listening to a few hours of the audio study for me to realize that NLP represented powerful techniques that I could use in future to enhance both my life and those of others. The key factor being the way NLP effectively bypasses the conscious mind, that so often derails traditional psychotherapy and counselling, and rather works directly on changing behaviors at the unconscious level; whether negating 'internal representations' causing undesirable behavioral patterns or "installing" positive new ones. I could go into a huge amount of detail about specifics but intend to do so elsewhere here at EiR. What I will say in conclusion is that I feel my NLP journey has only just begun and I will be applying its techniques to every area of my life (including health and well-being) for years to come; in fact I plan to incorporate it into a therapy and coaching career in the near future.